Pia Meenakshi, a Bangalore-based artist and illustrator has come out with her line of hand-made watercolours. Let us tell you, they are perfect for your next art project. 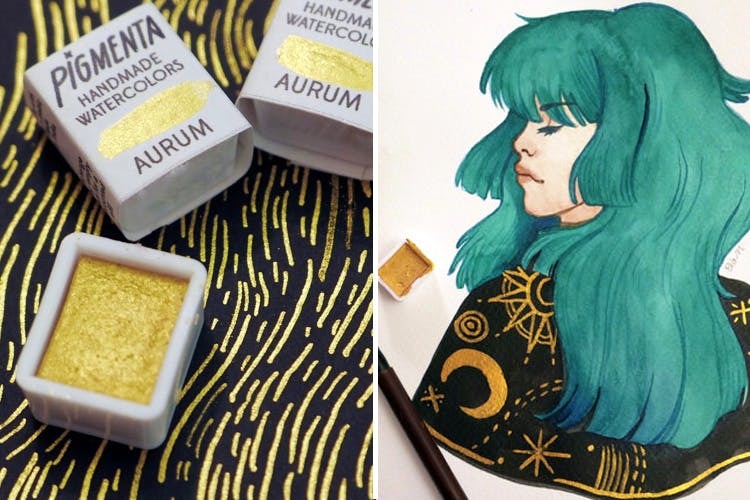 Pia is an artist and an illustrator from Bangalore who has launched her debut collection, Pigmenta after working on it for almost over a year. The reason she wanted to create these paints herself was because she realised there was a dearth of affordable and quality paints in the market, especially with colours like gold. Therefore, Pia decided to work on her on watercolours. Pia tell us that these paints are created with synthetic pigments and mixed with natural ingredients like water and honey to give it consistency. The gold and metallic collection is absolutely dreamy. Pia has worked with metallics, and has introduced shades of dark, light, and even rose golds for artists to work with. She thinks these shades go beyond the regular primary colours, and we couldn’t agree more. The basic idea is to let artists experiment with gold, a colour that is highly underrated – in terms of highlights. The collection includes dark gold, light gold, rose gold, iridescent blue and pink. What else? We’ve been told she’ll be launching silver soon too. Every paint is handmade and costs INR 200 a pop. The shopping is available pan-India, and you can place your orders with them now. Get your creative hat, and get embellishing your artwork with these lovely handmade paints. In fact, the second collection will be released in November, and the series will include neon watercolours. To place your order, go here. Pigmenta will also release a collection of earth pigments, along with unique stationery items like accessories, and sketchbooks for the artists soon.